The youth from Good Samaritan are having our annual BBQ Cook-Off. Do you or someone you know enjoy cooking BBQ? 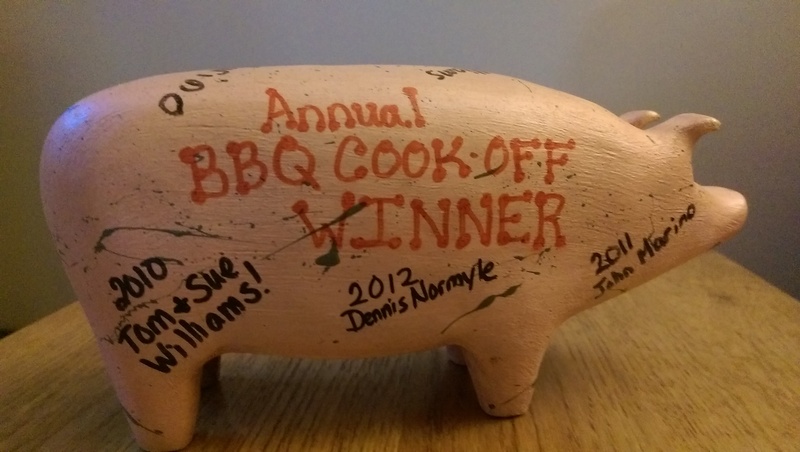 If yes, then come enter your special recipe, and see what the judges and people have to say about the flavor of your BBQ. Signup sheets available in the fellowship hall for judges and contestants. Do you just enjoy tasting good BBQ, then we need you too! This is a family event, with games for the kids, a silent auction, and a live dessert auction. Don’t miss out on the family fun!! We sign ups for donations of silent auction items. The money raised is going to offset the youth and chaperones who are attending the ELCA National Youth Convention in Detroit, Michigan in July. There will be $2 fee for BBQ samples. Drinks, and chips will also be available for purchase. Calling all ex-high schoolers: Yes, we have all gone on to college or work across the country or county, but it is good to all come back together. And so we announce the first post-high school youth group reunion for everyone who had Rick and Corinne as youth leaders. Join us for dinner and conversation on Saturday, December 20. We will meet at the church at 6 pm for a burrito bar. There will be cards to sign for Rick and Corinne as they have officially “retired” from teaching high school this year. Please let Stephanie H. or Amy S. know by Wed. Dec. 17 if you can make it (and if you can bring anything for the burrito bar). Contact the church office at office@goodsamlutheran.com if you are looking for contact information for Stephanie or Amy. What Does a National Youth Gathering Look Like? Every three years we have the opportunity to attend this event, making it a triennial gathering. Over 30,000 youth and 5,000 leaders and presenters will attend. The upcoming gathering dates are July 14-19, 2015 in Detroit. There are five major components to the 2015 ELCA Youth Gathering daily programming. Each day, youth, volunteers and their Adult Leaders will gather in Ford Field to hear the day’s Scripture text articulated by engaging speakers and Christian musicians, as well as stimulating video and interpretive dance. During the middle of the day, congregational groups will participate in a three-day activity rotation that includes a day of service in the Detroit metropolitan area (Proclaim Justice Day), a day of exploratory learning with other groups from their synod (Proclaim Story Day), and a day of interactive learning in the Convention Center (Proclaim Community Day). The fifth program component is called Community Life, which takes place in various venues, including some hotels. The Community Life activities include dances, game rooms, prayer stations, and an activity called Final 15. The Final 15 was introduced at the 2006 ELCA Youth Gathering in San Antonio, and has been a program staple ever since. It is a 15-minute time period where everyone at the Gathering, regardless of where they are located, stops to pray and reflect on the Scripture of the day. Check out the website to learn more: http://www.elca.org/YouthGathering. We are sending a great group of kids and adult leaders so please take note when you see fundraising opportunities to support this endeavor. The youth at Southern Calvert Baptist Church are taking a stand against the evil of human trafficking in Maryland. In their quest to do this they have formed a group called Maryland Teens Against Trafficking (MTAT). The goals of MTAT are to educate other teens about what human trafficking is, teach teens how to protect themselves and their friends, and advocate for better laws protecting the young lives caught up in this form of modern-day slavery. MTAT invites all 12-20 year olds to come learn about this important issue. They are hosting a free awareness event on September 20, 2014 from 6:00-8:30 pm at Southern Calvert Baptist Church in Lusby, MD. There will be a live band, food, and a dynamic speaker from the Maryland Rescue and Restore Coalition. Sunday School — Rally Day is September 7! Sunday School Rally Day is September 7! Come, find your classroom, and meet your Sunday School teachers for 2014-15 in their classrooms and then plan on going to the church picnic at Cecil Park. We will also be giving out our 100 Sunday awards. Mark your calendars and plan to come out for a fun day at church. Our first full Sunday School class will begin after fellowship time on September 14, from 10:30 to 11:30 am. We have received a great amount of donations for the yard sale and are in need of more people to sort and set up on Thursday and Friday, July 17 and 18 (12-4 pm). We are also looking for people to help during the Yard Sale on Sat., July 19 (7 am-12 pm). If you can help during these times, please contact Sue V. or Ginger L.
Let’s send the seniors off to college with a splash and welcome the new 9th graders into the group! Join us for fun and food at Rob and Judy K.’s home. Bring a suit and a towel for the pool! Bring lawn games if you like. Let us know if you can bring a side dish like potato salad, chips, soda, watermelon, corn on the cob, etc. We are providing burgers, hot dogs, and buns. We want to invite you to help us rethink Sunday School. We want your ideas…. New Format? Guest Speakers? New time or setting? What do you want to learn about? How shall we serve? New activities: Leading worship? Offering music? Prayer buddies? Mentoring younger kids? Teaching Sunday School? Tell us what you might like to try and what you are interested in.